Welcome to Sandpiper 401. Be prepared to enter and stay in comfort. 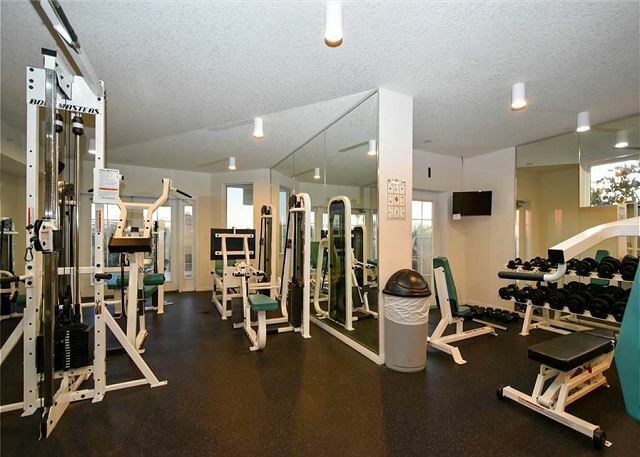 This condo was recently purchased and completely renovated. The furniture is new along with the accessories. No expense was spared. Every television is a smart TV and the living room tv is 62", the bedroom is 48" and the bunkroom tv is a 24". The condo has a Kuerig for your morning coffee and everything need for your stay. All mattresses are new and Temperpedic. The living room has a sleeper sofa and a sleeper loveseat. Both have upgraded Temperpedic mattresses. This Beautiful Bay Front Condo has been professionally decorated to allow you all the enjoyments of your vacation destination and still bring you all the comforts of home. The corner unit has spectacular views overlooking the Award Winning Lazy River Lagoon Pool and Choctawhatchee Bay. Sit back and relax on your private balconies watching activities on the bay and you may even spot a school of dolphins. The views from this unit at night bring the Lazy River to life with a fantastic array of light! The master suite has a comfortable King Size Bed. It is decorated in rich jewel tones and has a 48" Smart TV with cable provided. Step through the sliding glass doors onto a private balcony. Relax on the outdoor chaise lounge and choose a book from our paperback library to read or simply enjoy the beautiful ocean view and sunsets. The bunk room has a door for privacy and is decorated in bright, sunny colors and has its own private bath. The kitchen is outfitted with everything you might need to prepare a wonderful meal. The counter-height table is an excellent place to eat or play a game of cards. The new owner has replaced all of the appliances with new stainless appliances and all of the accessories with top of the line to include a single serve Kuerig coffee maker. The tranquil setting allows you and your family to relax and enjoy our tropical paradise in luxury like you have only ever imagined..
You have access to many excellent amenities at Destin West Beach and Bay Resort including the 700 sq. ft. Lazy River with waterfall pool (heated in the winter), and gradual incline pool for the little ones. There is a beautiful lush garden complete with palm trees down by the Bay where you and your family are provided with picnic tables and charcoal grills. Our resort offers the only covered elevated walkway in the Destin/Ft Walton Beach area across highway 98. This walkway connects to our beachside resort. You also have access to all the amenities on the beachside which includes a 5,000 sq. ft pool, a 1/2 covered pool, kids pool, and whirl pool spa, spray park and a state of the art work out facility. Best of all is the access to the beautiful Emerald Waters along our powder white sandy beaches. The Boardwalk is directly across the street with shops, and restaurants, and entertainment. We are pleased to report that our unit has had many repeat guests that have enjoyed their stay time and again. We invite you to join them and stay with us at one of the most sought after destinations on the Emerald Coast! IF YOU HAVE FRIENDS OR FAMILY YOU WANT CLOSE BY, we also manage VRBO# 763623 on the same floor as this condo. The condo was very nicely furnished and clean. It had a great view of the pool/lazy river. Kitchen and baths were nice and both the mater and bunk room had plenty of space for our family of 5. The only con for us was walking to beach was a little further than we are used but having the wagon and beach toys were great. We paid for beach service daily which was totally worth it rather than lugging chairs/umbrellas that distance. Had a great time with 2 12 year old grand daughters in tow. They loved the lazy river at night. Staff was very helpful. Dear Ms. Bangerter, Thank you so much for your 5 star review! We're so happy to know that you enjoyed your vacation time with your family in 401 Sandpiper! We'll hope to hear back from you next year when you're ready to see some more Florida sunsets! Fantastic Labor Day Long Weekend! Fabulous condo with great property amenities! It was fresh and clean and had everything we needed! The bed in the master was very comfy too! Dear Ms. Pruett, Thank you so much for sharing your experience in 401 Sandpiper! We're so happy that you loved your stay! We'll be standing by to help plan your next visit whenever you're ready to put your toes back in the sand! My husband and I came for a relaxing get away for the end of the summer and enjoyed every minute. The condo was exactly what was expected and shown in the pictures. The owner was extremely easy to work with and very pleasant in every way. Dear Ms. Heurtin, We're so grateful for this wonderful review! We love hearing that you had a great vacation and we certainly hope you'll be back to stay with us again soon! As always, we had an awesome time at Destin West. This was our 5th year in a row and we will be coming back next year. This place is perfect for our family. Dear Mr. Griffith, Your wonderful review is so appreciated! Thank you so much for sharing your experience with us! We'll be looking forward to your next visit! Condo was fantastic. The whole facility was so great we hardly went off site!! Condo was updated and very comfortable and very clean!! Would pick this same spot again when we go back. The kids loved all the pools!! Dear Mr. Breslin, Thank you so much for leaving this wonderful review! We love hearing from our guests! We'll be standing by to help you plan your next trip! Wonderful stay! My father is handicapped and everything was extremely accessible from the condo to the lift that assisted my father to the pool and lazy river. Highly recommended. Beautiful views of the bay. We will definitely be back! Dear Ms. Moore, We're so grateful for your wonderful review! We love hearing from our guests and are so happy to know you and your family enjoyed your vacation! We can't wait to have you back! We loved our stay! The condo was well stocked and very clean. The owner/mgmt. staff were excellent and helpful; no problems at all! We will definitely book again. This was our 6th stay at Destin West. It is the perfect location for us and our teenage boys - lots to do and places to roam. Dear Ms. Davis, Thank you for such the wonderful review! We love to hear that our guests have enjoyed their time with us! We are in this business for the families and we're ready to book trip number 7 whenever you're ready to come back! Overall we had a great time. My family enjoyed going to the beach (using the garage amenities), the lazy river, and pool. We found the condo was dirty when moving some of the furniture (coffee table when opening sleeper sofa) and placing items under the bed. I think housekeeping cleans what they can see but doesn't dust or clean under furniture very well. Dear Ms. Swick, Thank you for your feedback. It is information like this that allows us to focus our efforts in more specific areas to improve or business. Our housekeepers work very hard during summers to keep up with a vigorous demand. Each condo is inspected prior to arrival, but that doesn't mean we are perfect and never miss a hidden cheerio. We pride ourselves on cleanliness and are always working toward perfection! I am glad that the rest of your stay was fabulous and that you enjoyed your vacation! Thank you for recommending us to your friends and family! We hope to have you and your family back again soon! Sandpiper 401 was everything we could want. The condo was clean, well decorated, plenty of room and well equipped. Management were polite and always willing to solve any problem or request. We are looking forward to returning next year. Dear Ms. Hunter, Thank you so much for your sweet comments! We're always working toward perfection and are so pleased to know that you enjoyed your stay in this beautiful condo! We can't wait to have you back again next year! Condo had everything we needed. Loved the garage full of wagons and beach toys so that we did not have to bring from home. Great views of the lazy river, palm tress and the bay. The pools and hot tubs from the resort were very nice and clean. Enjoyed the heated pool at the Ramada on cooler days. Thank you for the ease in booking and communication for our stay. Thank you! Dear Ms. Wargo, I'm so glad that you were able to enjoy our beach service. October is a lovely time to visit the beaches! Thank you so much for taking the time to leave us such a wonderful review! We'll look forward to your next visit! Thank you, Eric. We look forward to having you back soon. The condo was fantastic; recently remodeled, very clean and as good as its pictured. 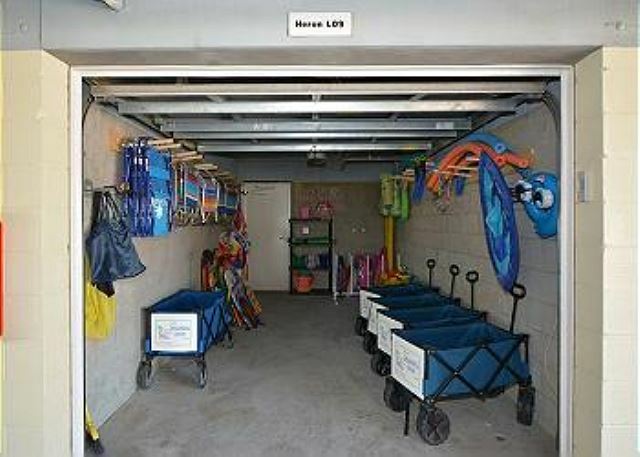 The garage with chairs, umbrellas, sand toys and the carts were awesome; no need to pack those items for the trip. Only draw back in the walk across the bride if that is where you spend most of your time, but the trade off is the lazy river pool, so all in all good to have all options and not a big deal. cute, comfortable and clean. loved it! We loved staying at the Destin West! It was perfect for our family. Our condo was great. From the cleanliness, beautifully decorated, and having everything that we needed. The only thing that was a poor experience was this older gentlemen that came up to me and my children and started to accuse my children of playing with the fire extinguisher box. He was very nasty and upfront about why they were playing with it. However not realizing that they were NOT playing with it and with their mother standing right there basically seeming to accuse me of not watching them. The reality was that my older children were touching it to stop their younger siblings from touching it. But for him to assume that they were playing around with a parent standing right there was just plain rude. We really enjoyed the condo and the views was breathtakingly... I would most definitely choose this condo again! Thanks Yolanda! We look forward to having you stay with us again. This was our first vacation to Destin and our first stay with Destin West. We brought our 2 sets of twins, ages 10 and 12 and had enough room with the bunk beds and sleeper sofa. This condo included a lot of what you would need away from home, dishes, towels, sheets, etc. We brought laundry detergent, soap, trash bags, dishwasher soap, ziplock baggies, toilet paper, and paper towels. It was great to be able to cook dinner if we wanted to. The kids loved the pool and lazy river. The garage with all the beach essentials was nice and it wasn't too far of a walk to the beach each day. When we come back with the kids, we will likely need something with a little more room. We will definitely be back though! Easy to book via VRBO 6 months ago. Ownership changed hands about a month before our arrival, and new owner did not use VRBO.